New luxurious and modern studio apartment for rent is the center of Makarska, close to the sea on the peninsula, "Osejava". It has a double bedroom + kitchen in the bedroom and bathroom. The maid clean apartment every day what is included in the price. Ideal for guests arriving by plane. Luxuriously furnished studio apartment located in the center near the sea, next to the famous hotel "Osejava", located only 50 meters from the sea near the beach, restaurants, shops, bars and entertainment facilities makes them ideal for guests to Makarska arriving by plane. It has a double bedroom + kitchen in the room, bathroom sea. marina and the town. The maid clean apartment every day what is included in the price. Luxurious apartment is in the center near the sea, next to the famous hotel "Osejava" Close to the beach, restaurants, shops, bars and entertainment facilities makes them ideal for guests who arrive by plane in Makarska. It consists of one double bedroom, living room, kitchenette, bathroom / toilet and a balcony overlooking the sea and mountains. The maid clean apartment every day what is included in the price. Luxurious apartment is in the center near the sea, next to the famous hotel "Osejava" Close to the beach, restaurants, shops, bars and entertainment facilities makes them ideal for guests who arrive by plane in Makarska. It consists of one double bedroom, living room, kitchen, 2 bathrooms / toilet and a balcony overlooking the sea. The maid clean apartment every day what is included in the price. Tourist house by the sea is located in the western part of Makarska next to the famous hotel "Park". They are located just 40 meters from the beautiful sandy beach of one of the most beautiful on the Adriatic. It has 5 newly built and modern furnished studio apartment for 2 or 3 people. Beautiful view. Apartment Jelenka located in the center of Makarska on the waterfront, has one double bedroom, kitchen, living room, bathroom / toilet and a balcony overlooking the sea and islands of Brac and Hvar. The apartment is located just 250 meters from the beautiful sandy beach. It is equipped with all the amenities for a pleasant family holiday. 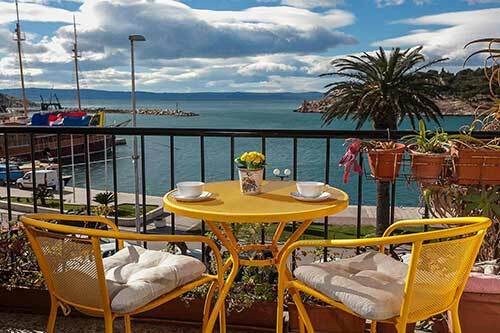 Well equipped apartment located in the western part of Makarska close to the sea and the many restaurants, bars and other entertainment facilities (near the hotel "Park"). The apartment consists of 2 double bedrooms + living room + kitchen + 2 balconies and parking. New modern apartments for rent is located in the central part of Makarska close to the sea, beaches and numerous restaurants, bars and other entertainment facilities (in the vicinity of the hotel "Meteor"). The apartment consists of 1 double bedroom + 1 single bedroom + living room with kitchen and dining room in the living room + balcony + garage. New modern apartments for rent is located in the central part of Makarska close to the sea, beaches and numerous restaurants, bars and other entertainment facilities (in the vicinity of the hotel "Meteor"). The apartment consists of one double bedroom + living room + kitchen with dining room in the living room and balcony + garage. New modern apartments for rent is located in the central part of Makarska close to the sea, beaches and numerous restaurants, bars and other entertainment facilities (in the vicinity of the hotel "Meteor"). The apartment consists of 2 double bedroom + living room + kitchen with dining room in the living room + bathroom + balcony + garage. Apartment on the beach for rent is located by the sea in the western part of Makarska next to the famous Hotel "Dalmacija". They are located just 20 m from the sea and beautiful sandy beaches. The apartment has a double bedroom + living room + kitchen + bathroom / toilet + 2 balconies.